Update on Hawaii Lava Flow "Slow Motion Disaster"
Sunday, October 12, 2014 - One hundred twenty radio amateurs provided communications support for the 2014 Bank of America Chicago Marathon and its 2000 volunteer medical teams that work at 20 Aid Stations, two in-course field medical tents and the main medical facility in Grant Park. New for this year, the teams also walked with the nine Triage units who attended to runners within Grant Park. The hams communicated back to the ambulance company if further medical support was needed. Some of the ham operators on these teams walked as many as nine miles in the Park. The historic and long-running Bank of America Chicago Marathon is the pinnacle of achievement for elite athletes and everyday runners alike. On race day, runners from all 50 states and more than 100 countries set out to accomplish a personal dream by reaching the finish line in Grant Park. Most of the amateurs were deployed to the Aid Stations and helped the medical teams with communication issues. This was the sixth year that the ham radio community has supported this event. Operators came from four states and from cities as far away as Madison, Milwaukee, Indianapolis, Peoria and Pittsburgh. Twelve local ham radio clubs were represented. One team has come from Peoria every year for the past six years, and provides their own lodging and then drives back at the end of the event. Six local repeaters, and several simplex channels are employed. Many of the stations and communicators needed to be operational by 6:30 AM to let organizers know when the medical teams arrived and to assure that their medical services and supplies were in place and ready. Once the race begins, the hams continue to support the ambulance company and medical teams with information about transports and supplies. Eight operators worked at the Forward Command tent, alongside event officials, Chicago City Services and other agencies, providing health and welfare traffic to the medical doctor in charge, the medical logistics teams and the ambulance company. As Amateur Radio operators provide public service and promote international goodwill and understanding, the International Humanitarian award is dedicated to those amateurs who, through Amateur Radio, are devoted to promoting the Welfare of mankind. The selection of the recipient of the award is made by a committee appointed by the President of the ARRL. Any licensed radio amateur world-wide, or group of amateurs, who by use of Amateur Radio skills has provided extraordinary service for the benefit of others in times of crisis or disaster, is qualified to receive the award. Nominations for the award will be accepted by the committee from a licensed radio amateur, governmental or any other organization that has received the benefits of the radio amateur's extraordinary service within the last 3 years. In the event that no nominations are received, the committee may determine possible recipients or may decide to make no award in a given year. All nominations and supporting materials for a given year's award must be submitted in writing in English to "ARRL International Humanitarian Award, 225 Main Street, Newington, CT 06111," in sufficient time that they are received by December 31. A summary of the actions of the nominee that qualify the recipient for the award must be included, along with statements from at least two references including names and addresses for verification. The award is to include the following elements: An appropriate plaque or medallion to be presented to the recipient(s) at a home convention or event within the US, or the ARRL National Convention or a mutually agreed upon arrangement to be made with recipients residing outside the USA. An article describing the extraordinary achievements of the recipient(s) is to be written for use in QST, other ARRL venues and consumer magazines. I appreciated your article in the November 2014 issue of QST (Public Service column) on operating in winter and the cold. I'd like to add several points: It's better to travel in a small group (3 or 4 minimum) so that if one is hurt and/or a victim of exposure, an evacuation can be started immediately. Use the buddy system, developed by scuba divers to ensure immediate rescue and life support if indicated. Operators in the field should dress in layers, and have a personal thermometer and wind chill charts to have a realistic assessment of conditions, and thus risks. Batteries drain faster in the cold so insulate yours for longer life. Have a personal heat source such as chemical hand warmers not only for your hands, but tucked in shirt pockets under your jacket and/or pants pockets to keep the body's core warm for better functioning and safety. Michael Meier, WB7RBH, is Idaho's Section Emergency Coordinator and Public Information Coordinator, and is always looking for ways to get more of the state's amateur community involved with public service communications, including the annual Simulated Emergency Test (SET). Meier's ARES organization plans for and participates in the SET, and tries to tailor their operation for the state's diverse geography, including mountains and plains. For the past three years, they've concentrated on message handling and the use of recognized message formats, while tracking depth and breadth of statewide participation by message totals and origins. After-Action Reports helped identify strengths and weaknesses. This year, however, was different, reported Meier. 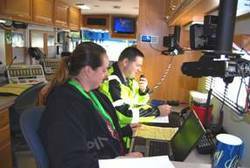 "One of the counties (Latah) was planning a county wide exercise, which involved 24 hours of operation and testing of almost all modes including voice, digital, and cw. Bill Ward, K9GRZ, the planner of this operation, wanted to know if Meier could help him recruit other counties to give them more check-ins to lend more realism. So, SEC Meier started a campaign to get the word out via numerous outlets, including the state's ARES website www.idahoares.info, and also through email, club notifications, and posted news. The SET plan developed legs, and interest grew rapidly. Planners put a net control in a tent out in the wilderness, running nominal transmitter power, portable antennas, and purposefully less-than-ideal operating conditions. "We wanted to simulate conditions realistically to hopefully see what would happen in the real world," said Meier. Stations in several counties were set up at the local EOCs, while others teamed up and "went portable" like a Field Day operation. Starting on October 11, per a previously agreed upon protocol, stations employed HF SSB for the first 20 minutes of each hour, then digital PSK31 for the next 20 minutes, and finally cw for the last 20 minutes. Stations working all three modes were kept very busy, with the operation continuing non-stop for 24 straight hours. Local ARES groups and nets were also encouraged to take VHF-UHF check-ins and relay those stations into the larger operation. Net frequencies and bands were changed smoothly on the fly as propagation and conditions dictated. When all activity and messages were tallied, Idaho had 1400 check-ins to the SET in 24 hours. On HF, 619 SSB contacts were noted from 24 Idaho counties and eight other states, with 88 individual stations participating. There were 219 cw contacts made from all six Idaho ARES Districts, eight other states and by 24 individual stations. PSK31 was popular, with 127 contacts made from 12 counties, five other states, and 31 individual stations. On VHF, 424 contacts were made by 96 stations. An overall total of 1389 contacts were made by 239 stations. According to Meier, some 5.3% of Idaho Amateur Radio operators participated, "which is outstanding," he said. "I am so inspired by our Idaho Amateur Radio operators and ARES," Meier concluded. "All of our ARES operators stepped up and conducted a fantastic SET 2014; this one is going to be hard to beat." The morning of the fourth of October started cold with the forecast for a sunny but cool fall day. The page went out to operators at 9 AM to respond to a staging location near a major shopping mall in St. Peters, Missouri. The SET scenario indicated a severe earthquake in the New Madrid Seismic Zone that had also triggered a large quake in the Wabash Valley Seismic Zone near the Illinois/Indiana border. These quakes resulted in significant damage in the St. Louis metro area, including all surrounding counties. St. Charles County ARES responded to the page and about 20 volunteers arrived to assist in the damage assessment exercise. ARES operated for and in four operations centers in St. Charles County and performed damage assessment in areas throughout the county. Agencies including the National Weather Service, St. Peters Law Enforcement, Mall Security, St. Charles County Sheriff's Department, four Emergency Management agencies and two hospitals were contacted, totaling 11 agencies in five communities. St. Charles. The exercise concluded at 1230 hours and all participants were requested to meet at the County EOC where the hot wash was held and lunch was provided by the St. Charles County Division of Emergency Management.The group was addressed by Bill Grimsbo, N0PNP, the St. Charles County Emergency Coordinator (who is also the Missouri District C Emergency Coordinator), Jeff Young, KB3HF, the Missouri Section Emergency Coordinator, and Capt. Dave Todd, Director of the Division of Emergency Management. "Again this year, we learned much about what works and what does not," said Grimsbo. "Next year, we will apply the lessons learned to help us improve our disaster communications systems and techniques." Lessons learned from last year's SET that were applied this year included: Separating antennas and getting the simplex net antenna up about 20 feet solved the communications issues experienced last year with coverage; ensuring there were at least three people at Staging at all times reduces the work load of the NCO; and mobile two-man teams is a must to ensure the communications does not interfere with driving. Some areas to improve identified this year included: the EOC to EOC and Agency to Agency traffic should be restricted to the EOC net, not handled at staging, which should handle only the traffic with the field teams; better logging of damage assessments is needed; reports and traffic at staging was difficult to manage and it might be better to have the field teams fill out damage assessment reports rather than reporting them over the air. Bob Schneider, AH6J, Pacific Section Manager, reports the front of the Puna lava flow is still stopped. "However, there are now several breakouts along the side and the first house has been destroyed. There is no forward movement as of today, November 12," he reported. "The result of the side breakouts is that the flow is getting wider." In an ARRL news report dated October 29, amateurs were drafting plans in case they needed to activate in response to the Puna lava flow. Lava flows are nothing new to many Hawaiians, said Schneider, who called it "a slow-motion disaster." ARRL deployed Ham Aid kits to Hawaii for a possible lava flow response. Schneider said DECs have been establishing area-specific ARES standard operating procedures in the event of an activation. Conventional telecommunication systems were working and power to the area was still holding, he said. Hawaii Civil Defense authorities deployed a remote emergency operations center to the affected region in September. Bitter cold temperatures and snow are hitting two-thirds of the country, exposing people to dangerously frigid weather and causing home heating systems to work overtime to keep everyone warm. The American Red Cross is urging people to use caution when heating their homes in these cold conditions and offers way to stay safe during the deep freeze. â¢ Keep all potential sources of fuel like paper, clothing, bedding, curtains or rugs at least three feet away from space heaters, stoves, or fireplaces. â¢ Don't leave portable heaters and fireplaces unattended. Turn off space heaters and make sure any embers in the fireplace are extinguished before going to bed or leaving home. â¢ Place space heaters on a level, hard and nonflammable surface (such as ceramic tile floor), not on rugs or carpets or near bedding or drapes. Keep children and pets away from space heaters. â¢ When buying a space heater, look for models that shut off automatically if the heater falls over. â¢ Never use a cooking range or oven to heat your home. â¢ Use a glass or metal fire screen to keep your fire in your fireplace. Make sure it's large enough to catch sparks and rolling logs. â¢ Have wood and coal stoves, fireplaces, chimneys, and furnaces professionally inspected and cleaned once a year. â¢ Bring pets indoors. If that's not possible, make sure they have enough shelter to keep them warm and that they can get to unfrozen water. â¢ If you lose power, go to a designated public shelter to stay warm. â¢ Avoid driving in sleet, freezing rain, snow or dense fog. If you have to travel, keep a disaster supplies kit in the car. â¢ Check on your elderly neighbors. Help those who may need special assistance, including people with disabilities and children. â¢ Before tackling strenuous tasks such as shoveling show, consider your physical condition. â¢ Know the signs of hypothermia - confusion, dizziness, exhaustion and severe shivering. If someone has these symptoms, they should get immediate medical attention.